Bridge Housing continued construction of its modular affordable housing project, Marea Alta, bringing 115 residential units to Downtown San Leandro. The project is nearing completion and expects to open in early 2017. OSISoft moved into the first building of the San Leandro Tech Campus opened in October. 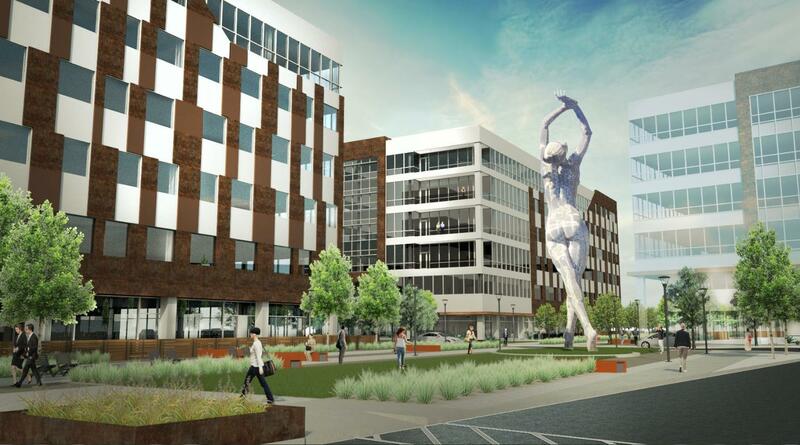 Full build of this project will include 500,000 square feet of new Class A office space. Significant progress was made on the Shoreline Development Project. Cal-Coast and the City continue to work on the remaining entitlements and permits. The City held multiple community meetings on the BayFair TOD Plan, a planning document for the Bayfair Center and the adjacent BART station. Funded by a $440,000 grant from the Metropolitan Transportation Commission, the plan identifies a vibrant and sustainable transit-oriented neighborhood. In partnership with the City of Oakland, Rails-to-Trails Conservancy and Merritt College, the City continued work on portions of the study for the San Leandro Creek Trail Master Plan, funded by a $200,000 Caltrans grant. The plan studies the feasibility of a pedestrian-oriented and attractively designed trail through San Leandro. The City completed the General Plan 2035 update, which will guide land use, design, and development in the City over the next twenty years. A number of updates were also made to the Zoning Code, which codifies changes outlined in the new General Plan, including higher intensity in Downtown San Leandro and the creation of an Industrial Transition Zone for services in industrial areas. On November 8, San Leandro voters passed several local measures, including modifications to the business license tax, which align with economic development priorities, reducing the business license tax for over 2,300 small businesses and modifying the tax for warehouse, wholesale and distribution businesses to better align with their impact. Besides improvements to Thrasher Park, and the overhaul of Siempre Verde Park, the City’s Engineering & Transportation Department also finished work on ADA upgrades to City facilities, pedestrian improvements on West Juana Avenue, the annual street resurfacing project, and a complete rehabilitation of the City’s Water Pollution Control Plant. 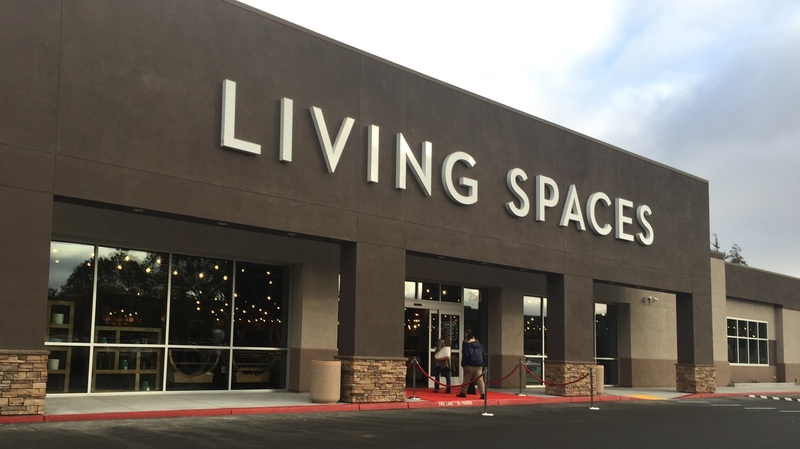 Living Spaces opened its impressive showroom in the former KMart property at Washington and Floresta Avenues. Around-the-clock gym Anytime Fitness moved into the former Hallmark store in the Downtown Plaza shopping center. At Marina Square, the innovative pizzeria Pieology arrived in May and in the fall Fairmont Square was joined by the much applauded Cinco Tacobar. The former Carrow’s Restaurant underwent a significant transformation, and in December, Original Mels Diner opened its doors. An array of additional restaurants have also opened during the past year, including Filipino restaurant Parekoy Lutong Pinoy (14807 E. 14th Street), Thai restaurant Elephant Bowl (185 Pelton Center Way), Cajun restaurant Craw Station (15040 Farnsworth Ave.), Dim Sum restaurant Pearl Bay Tea House at Marina Faire, and Mexican restaurant Los Cantaros (550 San Leandro Blvd). At 2150 Washington Avenue, Gourmet Cellar opened a specialty grocery store, also offering craft beer, fine wine, and free tasting events throughout the year. This year, for the first time, San Leandro was included in the East Bay Chinook Book, with 13 businesses contributing coupons for the 2017 edition. 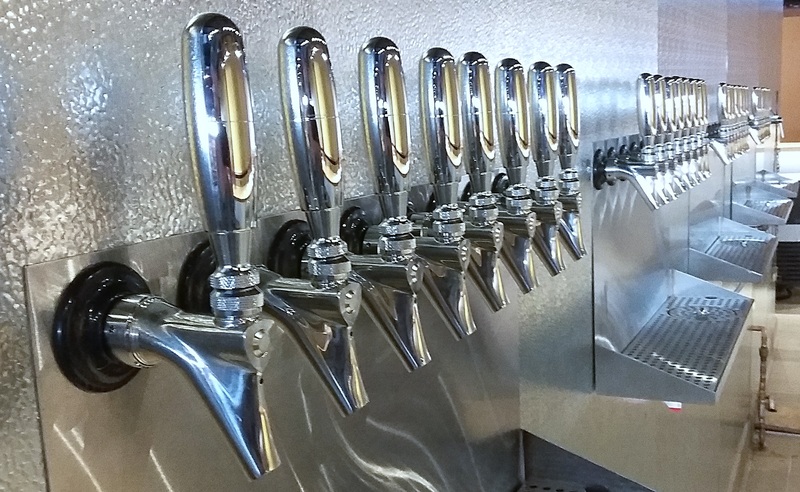 The Cooler opened its taproom to thirsty customers in July, providing a unique space for sipping craft beer, watching sports, bringing in your own food, and enjoying artwork by local artists. The highly anticipated Sons of Liberty Alehouse opened for business just before Thanksgiving, providing a vibrant and comfortable space to enjoy quality beer and elevated pub fare in the Downtown area. Eat Club set up headquarters in San Leandro early in the year, providing corporate lunch catering to the entire Bay Area. House Kombucha moved its operations from Oakland to San Leandro, brewing distinctive Kombucha teas and cold-brewed coffee. Building on San Leandro’s history in food manufacturing, coupled with the recent boom in advanced manufacturing, San Leandro has become home to innovative food manufacturers Tiny Farms, whose product is crickets for human consumption, and Memphis Meats, who has developed the science to culture meat from the cell form. The successful online consignment business ThredUp set up a distribution center in the industrial area, creating approximately 200 jobs. High-tech aerial thermal photography company TerrAvion also moved its headquarters to San Leandro, providing affordable and highly effective photometric data to the region’s agricultural sector. San Leandro continues to support public art created by local artists by installing artwork wraps on 25 utility boxes. When complete, the City will have a total of 41 utility boxes adorned with original art. 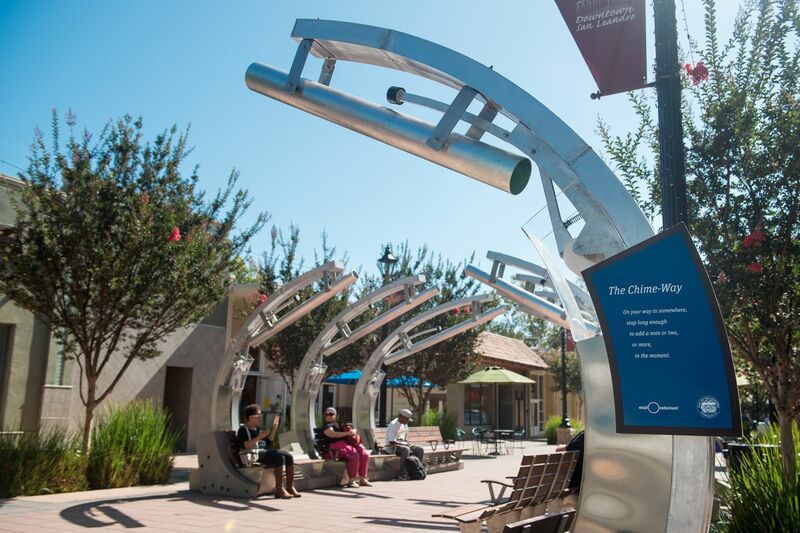 As part of the $1.4m grant received for park improvements, the interactive art exhibit “the Chime Way” was installed in at Joaquin Plaza by the Exploratorium. As part of the same grant, major improvements to Siempre Verde Park were completed, and the park was reopened in October. Enhancements were also made to Thrasher Park. 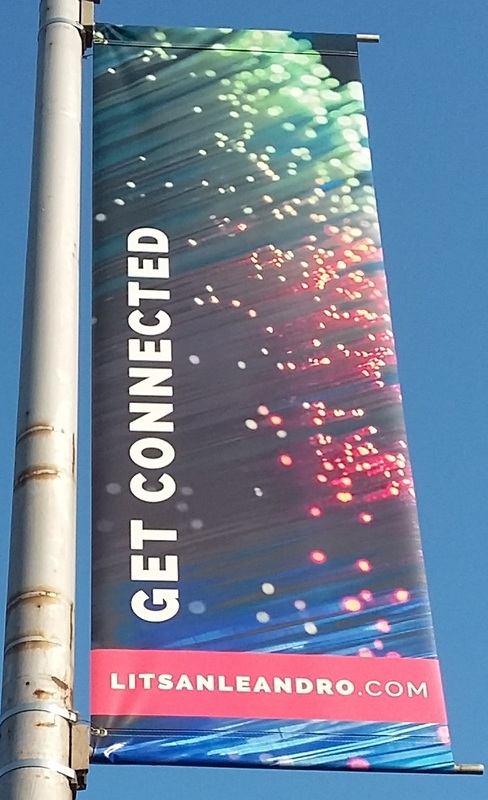 The City also installed new street banners along E. 14th Street and on Davis Street between E. 14th and I-880. The new banners consist of six theme pairs whose designs represent family life, safety, diversity, education, manufacturing, and technology. Through its Commercial Rehabilitation Program, the City also participated in three facade improvements that were completed in 2016. Improvements were made to Bancroft Uniforms at Bancroft and Dutton Avenues, Turner Eye Institute at 276 Dolores Avenue, and Mels Diner at 15011 Hesperian Boulevard. From fiber optics to renewable energy, and technology startups-in-residence to monumental art, 2016 was a pivotal year for innovation in San Leandro. The Lit San Leandro loop continues to expand and will reach almost 20 miles in 2017. 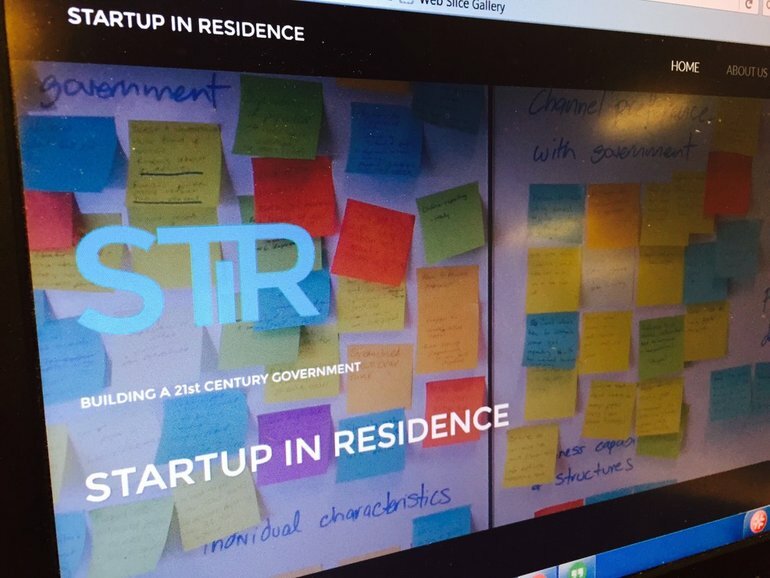 In February, announcement of the Startups in Residence program (STIR) launched the City’s new collaboration with tech startups to provide technology solutions for City challenges. San Leandro worked with Lotadata, Decision Patterns, and SyncFab on unique solutions to connecting product designers and manufacturers, provide online access to Recreation programs, and assist in Information Technology budgeting. San Leandro manufacturers Method Machine, Coca Cola, Type A Machines, PCC Structurals, Koffler Electrical, Urban Bloc, Olson Steel, Peterson Cat, Scandic, Mr. Plastics, Kennerly Spratling, Halus Power, OSIsoft and Energy Recovery participated in the 2nd annual East Bay Manufacturing Day. 450 students visited these businesses to explore career pathways in advanced manufacturing. 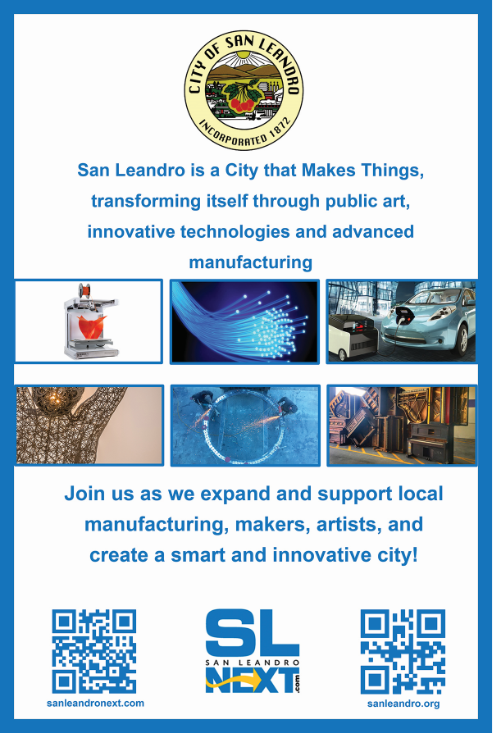 San Leandro emerged in 2016 into the Smart City arena. At Mayor Cutter’s State of the City address in March, she announced just-released news from the California Energy Commission that ZipPower Inc. (then called Olidata Smart Cities, Inc.), in collaboration with the City of San Leandro, OSIsoft, Lawrence Berkeley National Labs, GELI, PG&E and other partners, was the recipient of a $1.5M grant under the EPIC: Advanced Energy Communities program. The ZipPower project proposes to design a replicable, renewable energy system in San Leandro as prototype for acceleration of solar installations state-wide. 2016 was yet another amazing year in economic development, and there is still more in store for next year. For a snapshot of what next year will have in store, we will post a 2017 preview during the first week of January. Cordial Bottle Shop on MacArthur/Bridge has transformed into a specialty wine, spirits, and beer shop and is worth a mention in your article. This places brings neighbors together every weekend at tasting events and is changing the San Leandro beverage scene one bottle at a time. I just got a condo next to downtown and this site was a HUGE factor in pulling the trigger, so thanks! I’m curious though, are there any plans for a whole foods/sprouts to open in downtown? Safeway is good for a lot of things, but they don’t have everything that i’m looking for.